Kereama Taepa studied for his Bachelor of Maori Visual Arts at Massey University in Palmerston North, New Zealand, and continued on to gain his Masters degree. Taepas involvement in the arts have been broad and varied including bronze technician at the Dibble Arts Foundry and participating in various national Māori arts symposiums, workshops and hui. He has also been involved with fashion through his label Urbanmaori. As a finalist within the Miromoda Indigenous Fashion Awards twice he received entry to show at New Zealand Fashion Week in 2010 and 2011 within the Miromoda shows. 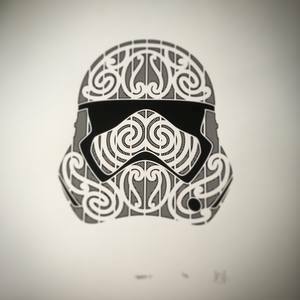 Taepa taught art within the Te Whare Wananga O Awanuiarangi Art and Visual Culture Degree for four years and currently teaches within the Bachelor of Creative Technologies at Waiariki Institute of Technology, Rotorua. He has exhibited his art nationally and internationally, and has works in collections across New Zealand. He has recently installed sculptures for the Four Plinths Sculpture Project outside Te Papa, Wellington, early 2016 and a public sculpture in New Plymouth, 2015. His first major commissions saw him design the screens for the new toilets on the Waipa side of the Whakarewarewa forest in 2014 and the shrouds surrounding the Redwoods toilets in Rotorua 2013. He is a Supreme Award winner of the Molly Morpeth 2D Art Award in 2008, and picked up the Manawatu Potter’s Society Award’s open award in 2002 and was recently the supreme winner for the Rotorua Art Awards.